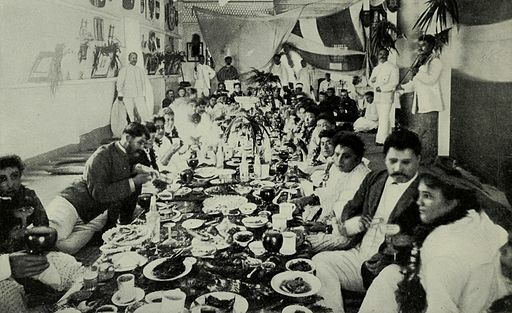 A tourist in Hawaii might feel incomplete without having attended a lu’au, a traditional Hawaiian feast. It’s the most celebrated Hawaiian tourist experience. 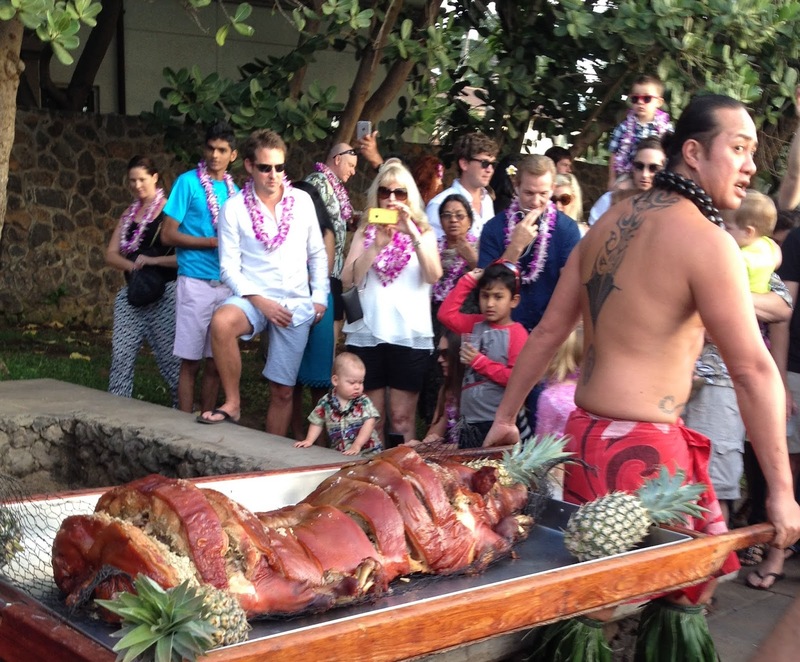 After all, it is a celebration, replete with a pig baked in an earth oven (imu), plenty of Hawaiian food, flowers and leis, and lots of hula dancers. Some lu’aus even feature fire and knife dancing, which is not traditionally Hawaiian, but makes for a great spectacle. Luau at the Wailea Marriott. This is the roasted kalua pig, removed from the imu, the earthen oven. Some people may think that the lu’au as a tourist activity contributes to the Disneyification of Hawaii, but it does promote the Hawaiian culture, even if it’s not what purists would like. It would be difficult for most people to have the opportunity to attend the kind of informal lu’au held by local residents rather than one at a hotel. A royal lu'au of King Kalaka'ua, which ties into the previous post about the first king of Hawaii. Source: Wikimedia Commons, public domain image. Though I’ve grown up here and have lived here most of my life, I haven’t been to a lu’au that was not a lu’au for tourists. A local lu'au might be for a special occasion like a wedding or a baby’s first birthday, a big deal in Hawaii. But they exist, and are quite a bit of work to plan, because someone has to butcher a pig (maybe even hunt a pig or raise a pig) and bury it in the imu with hot stones. Usually the imu is a permanent fixture in the back yard, because it takes also work to build. After the pig is unearthed and the luau is over, the oven has to be cleared out of all the banana leaves and ti leaves used to wrap the pig. One day at the community garden, a truck pulled up smelling like fresh roasted kalua pork. The local guys asked if we could use the steaming hot imu leaves in our compost pile, which we happily accepted. I wish they had invited us to their lu’au too! Kalua pig baked in an imu. Ahi poke (cut up pieces of raw fish and seasoning, not the same as sushi) Many tourists freak out. Poi (pounded taro root, gluey consistency) Takes getting used to, but the right poi can be yummy. La'u la'u - usually butterfish, pork, wrapped in taro leaves. One of the lu’aus on Maui that gets kudos for being more authentic is the Old Lahaina Lu’au. I’ve never been to it, but have been told it only features Hawaiian hula rather than dances from all of Polynesia, and there’s no fire dancing since it’s not Hawaiian. You can even get traditional seating up front on a floor mat, as long as you’re flexible. By the way, I’m not getting any kind of kickback/benefit from them, but if they decided to comp me two lu'au tickets, I would let you know. Lu’aus can be pricey, usually $90+/adult, less for children, and so taking a family to a Hawaiian style lu’au can be a major proposition. But if you’ve spent all the money to come to Hawaii, the argument is, why wouldn’t you go? Will you get another chance? Anyhow, that's how a lot of activities are marketed in Hawaii... and other places in the world. In my own travels, there are things I wished I had paid to do or see, and other things that I wished I had used the money for something else! You never know! Aloha and mahalo (thank you) for reading! I would love to go to a real Hawaii Luau - last year for my birthday, we had our own luau at the beach. Didn't roast a pig, but had some Hawaiian dishes and 3 1/2 gallons of scorpion bowls! Hello, Courtney! My husband and I went to Oahu on our Honeymoon. We totally missed going to a Lu'au, though! There was just so much we wanted to do and see and couldn't make it to everything. We're definitely going back to Hawaii so a Lu'au will top our list of things to experience then. I love Hawaii!! I've been to Hawaii once and I can't wait to get back. It is paradise on EARTH!! We enjoyed the Lu'au's so much! The next time I come to Hawaii, I am definitely going to a luau—touristy or private. One of my favorite things about being in Hawaii is eating. When the Husband and I were in Maui, we happened onto a Portuguese festival. The laulaus and the malasadas, drooooool. If I ever make it to Hawaii, I would definitely have to go to a lu'au. It looks like such a spectacle and the food sounds delicious. A nice post about a famous part of Hawaiian culture. It can be affordable but you have to plan. Shop around for flights w/ Hawaiian Air or Alaska or the other major airlines. I think SW may be flying there too. The other part is finding accommodations and they can range from inexpensive camping to fancy hotels. You will need a car though. There is no way around that. To everyone else who commented, mahalo and I will try to visit your blogs today. Love it! That's a great idea, having a lu'au party. What are scorpion bowls? I absolutely love luau food! We've been to the ones at the Polynesian Cultural Center (a couple of times), Paradise Cove, and Lahaina. It's fascinating how they're similar, but have their own approaches to the tradition. That's right! L & L is on the mainland too, big time on the West Coast. And me too, Polynesian Cultural Center is an Oahu mainstay. That is so sweet of you, and I am so intrigued by it but it will have to wait till after April! My mantra is "after April." Mahalo Jocelyn, and I finally got around to hopping to your blog and commenting. Lu'aus are great, but so much food!